The Prize in Psychology, which went to a multinational team that confirmed empirically that “people who think they are drunk also think they are attractive.” Their article, “Beauty is in the Eye of the Beer Holder,” was published in the May 15, 2012 issue of The British Journal of Psychology. A Joint Prize in Astronomy and Biology, awarded to Marie Dacke, Emily Baird, Marcus Byrne, Eric Warrant, and Clarke Scholtz, proves that dung beetles use the Milky Way for navigation; they can push their balls in a straight line when the night sky is clear, but not when it is overcast. 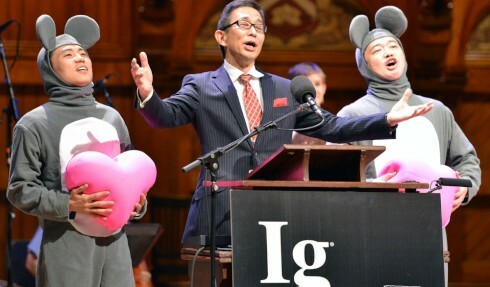 The Prize in Medicine went to a joint team from China and Japan for proving that post-heart transplant mice survive longer when listening to the Verdi opera, La Traviata, than to the music of Enya. (1) These findings were chronicled in The Journal of Cardiothoracic Surgery. And, I would add, to enjoy a good laugh! This entry was posted in Article, humor, Science and tagged 2013, humor, Ig Nobel Prize, imagination, Science. Bookmark the permalink. That gave me a good laugh, but with one reservation – I loved the study of the dung beetle – that is so fascinating! It truly is fascinating, and others seemed to have practical applications as well. I remember hearing studies of how plants do when exposed to different kinds of music. Worst was heavy metal. Best was classical or jazz. One researcher wondered if the common roots of that kind of music in church music (whether formal hymns or African-American spirituals) did not seem to matter. When we leave the dogs at home for any length of time, we usually tune the radio to the local jazz station. Yep – kind of a look back at Hollywood slapstick I thought. It would be a nice award to hang on the wall. So Enya may be a factor in heart diseases!? Fascinating! 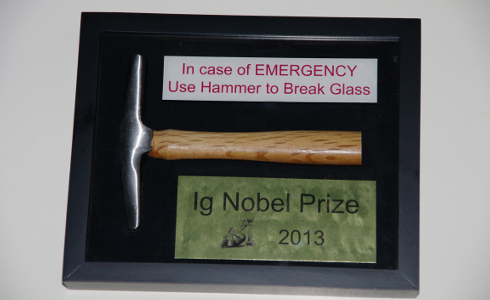 Love the Ig Nobel prizes…and this post about them! This is great. Thanks for the laughs. I needed that! It is, and there are lots more laughs if you follow the links to look at past prize winning projects.